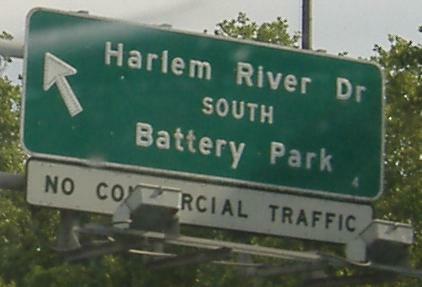 North of Exit 23, Harlem River Drive overlays the original Harlem River Speedway, a horse (and later car) racetrack and later a boulevard. That's why there's such a long straightaway at that point. 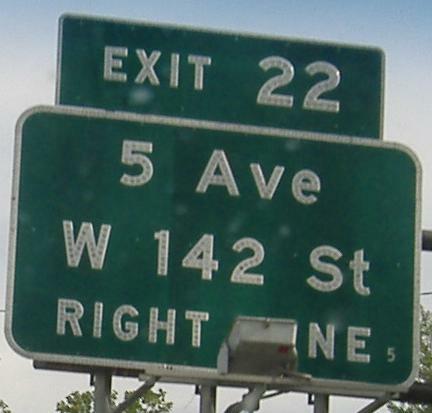 The SB Exit 23 ramps to 155th St. are the southern part of that boulevard. 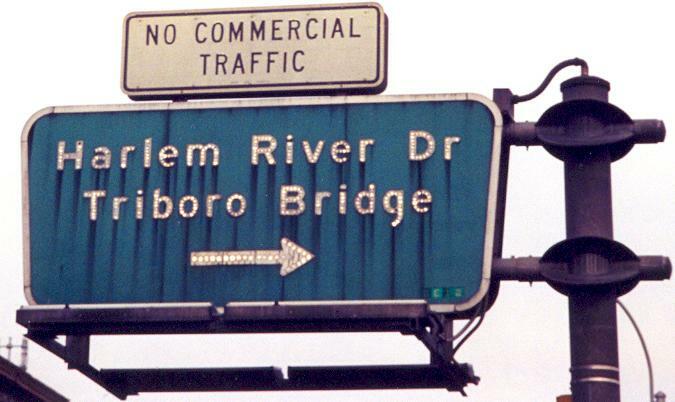 NB button copy starting at the Triboro Bridge, where Harlem River Drive begins out of the ashes of F.D.R. Drive. 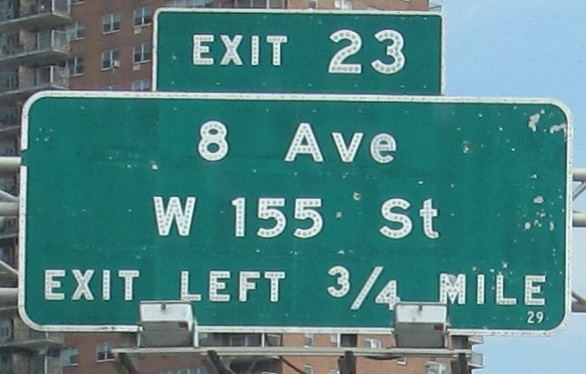 That's because FDR was formerly East River Drive, and the Triboro Bridge interchange is where the Harlem and East Rivers meet. Overhead at 138th St. at 5th Ave.
That's the Macombs Dam Bridge, Manhattan's gateway to Yankee Stadium. 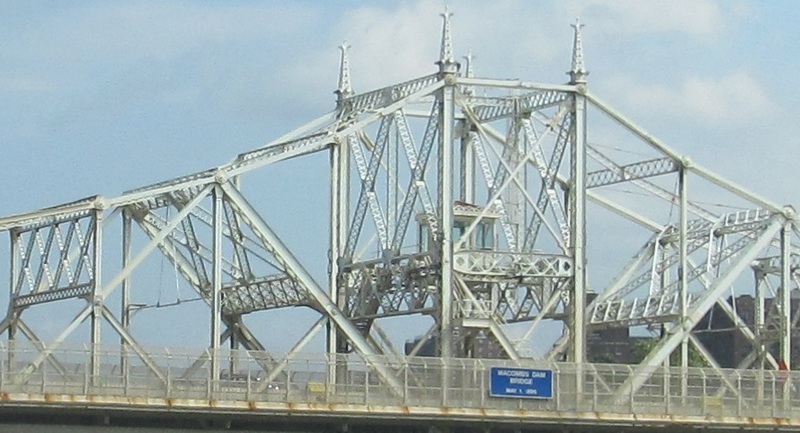 The western half is a swing span for Harlem River traffic. 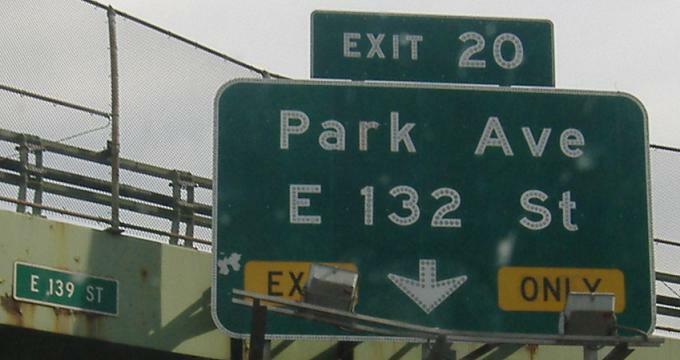 The Exit 24 ramp, not to mention the freeway continuation as Harlem River "Driveway" (talk about a misnomer), passes under the High Bridge aqueduct. 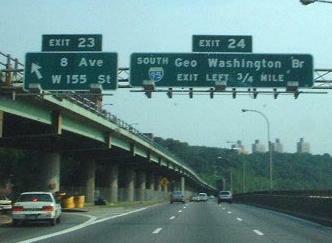 The Alexander Hamilton Bridge, carrying I-95, is in the background, hiding the Washington Bridge. Click on the first photo for a daytime version, showing the elevated SB lanes, courtesy Doug Kerr. 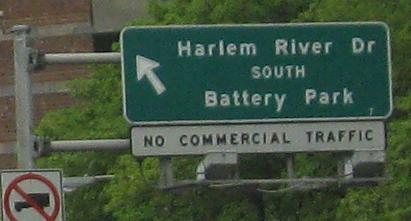 Harlem River Drive southbound from the top. The pavement quality isn't even as good as on other NYC freeways because hardly anyone comes up this way. 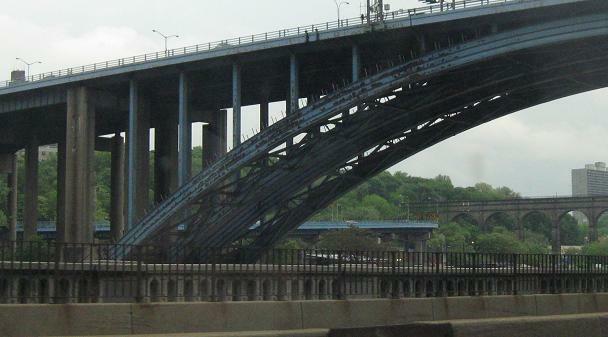 The bridges, in order, are the somewhat dirty Hamilton Bridge (I-95), the 1889 Washington Bridge, and the High Bridge. The High Bridge, namesake of the I-95 interchanges on both sides of the river, a Bronx neighborhood, and a Manhattan park, is actually officially known as the Aqueduct Bridge, because it had been part of the original Croton Aqueduct that supplied fresh water from the Croton River to New York City. It is the oldest bridge in the city, dating to 1848, except the steel arch in the center was constructed in the 1920's (originally, the entire bridge had stone masonry arches, but those were deemed a navigation hazard). Since the aqueduct was bypassed in 1917, it has been a pedestrian bridge, but it closed in 1970 due to a mischievous rock thrower. 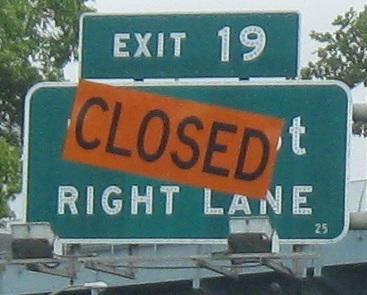 It is set to reopen soon after extensive rehabilitation. SB to the Macombs Dam Bridge. All SB; the last one is courtesy Doug Kerr because those signs are gone now. I don't know where this was, but I don't think it is any more. Courtesy John Krakoff. 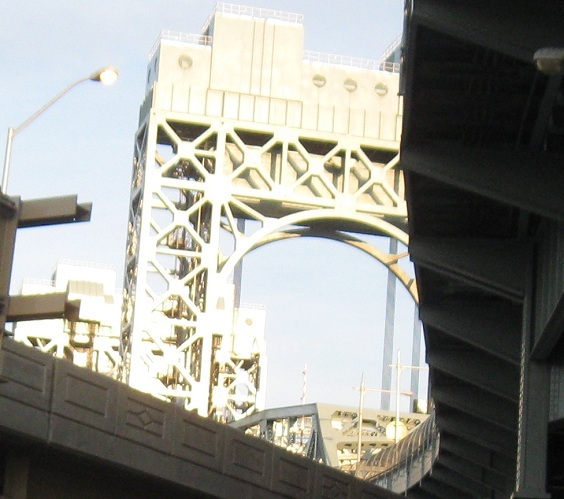 SB past the old Willis Avenue Bridge, and then its tan replacement, to the Triboro Bridge where Harlem River Drive becomes FDR Drive (they were conceived separately, and FDR/East River Drive came about first). 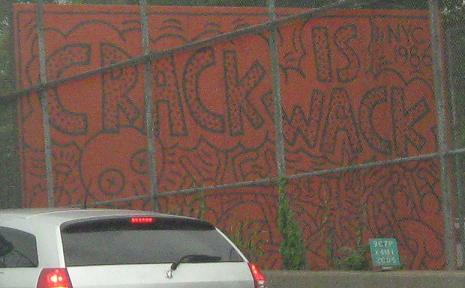 Crack was wack in 1986, especially to Doc Gooden fans. 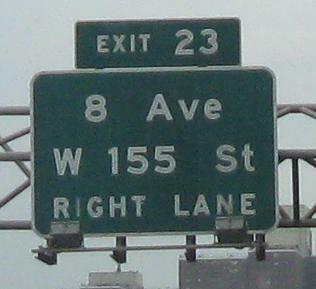 Click on the penultimate photo (Exit 16 1/2 mile) for a closeup of the button-copy shield.